I've think I've finished the exoplanet designs for Boskone. The last one is a moonstone with a star (diamond) in front of it's satellite. Also a large group of new rings including peruvian opal, gem quality chrysophrase, and a particularly lovely chrysocolla. "The Stars Change" pendant for Mary Anne Mohenraj is polished and complete. I'll try to photograph it but given the details I'm not too hopeful. 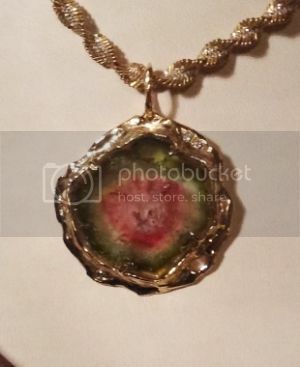 This is a large stunning watermelon tourmaline that I set in gold with 3 small diamonds for Wendy Czarnecki. This is one of the very most beautiful large watermelon tourmalines I've ever had. I wanted the design to subtly reflect the stone. Actual size is about 1.25". Chain is antique. And George, my new cat is learning with some success to coexist with jewelry making.